Psoriasis on hand/arm or foot is more common than you may think, as the disease occurs anywhere on the body. Many people are beginning to understand this skin condition but few have paid attention to the specifics of its effects and treatments based on its location. When located on the palm of the hands or feet, scientists refer to the condition as palmoplantar psoriasis. 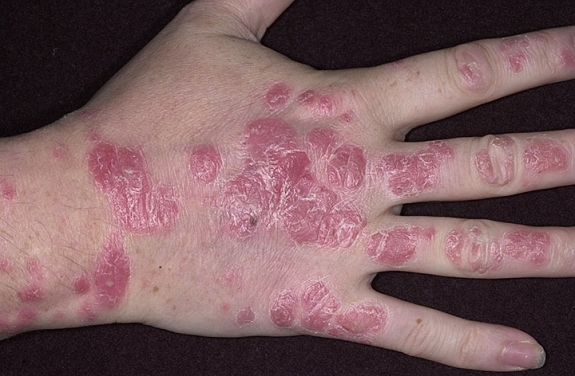 Psoriasis of the hand and foot using a combination of UVA light and the drug psoralen is a treatment option referred to as PUVA. Salicylic Acid: A common over-the-counter treatment, you can find it in many forms and use it to reduce the scales caused by psoriasis. Steroids: These help to minimize swelling and irritation associated with psoriasis. This form of steroids requires you to apply the topical cream to affected areas or take a pill. Doctors often prefer using steroids to treat psoriasis of the hands and feet since the skin in these areas tends to be tougher and harder to treat. If the condition does not respond to any of the above treatments, your doctor may prescribe oral or injectable medication. The most common types of medicine are cyclosporine, methotrexate and retinoids. Due to their potency, your doctor should require frequent medical intervention and tests to ensure you do not experience any adverse effects. While the condition can be painful and embarrassing, psoriasis on any part of the body is easier to treat if the diagnosis and treatment starts early. It is important to prepare for future flare-ups by having medication for psoriasis on hand. Keeping the skin moisturized, even when you do not have an outbreak, helps manage the condition. The condition affects people of all skin tones, making it more difficult to identify those with lighter skin-tones than on those with darker skin, as most people expect the scales to be red. When it affects the hands, it can be in the palms as well as on the back of the hands and may cover a large area extending beyond the wrist. Psoriasis on hand. Coal tar: It may take up to two months before any results become evident, but it is useful for reducing swelling and inflammation. Coal tar helps slow the production of skin cells, which helps to improve the look of affected skin. You can purchase this over-the-counter remedy as bath solutions, creams and lotion. Colloidal oatmeal: While not technically a treatment, using this to make a hand bath helps to soften callouses and lesions, making them easier to remove. Once removed, you can apply treatments and increase their effectiveness. Creams: These help alleviate the dry, itching, cracking skin resulting from the condition. Phototherapy: Exposure to sunlight or ultraviolet light from special lamps helps to manage the condition. Treating psoriasis of the hand and foot using a combination of UVA light and the drug psoralen is a treatment option referred to as PUVA. Steroids: These help to minimize swelling and irritation associated with psoriasis. This form of steroids requires you to apply the topical cream to affected areas or take a pill. Doctors often prefer using steroids to treat psoriasis of the hands and feet since the skin in these areas tends to be tougher and harder to treat. Psoriasis on hand.